Chief Calvin Bruneau of the Papaschase band sits at his desk while looking at a map of Edmonton. The land is familiar to him, but many of the names that represent the neighbourhoods, the streets and the schools aren’t. In the late 1800s, his great-great-great-grandfather, was the original chief of the Papaschase band, who lived on a reserve on the south side of Edmonton where present-day Mill Woods stands. Bruneau points to a few names in the city that hint at the history — the Papaschase Industrial area, the Sakaw neighbourhood, Menisa Park, and Meyokumin School. But of about 1,500 civically named places in Edmonton, just 10 per cent are Indigenous, Indigenous-inspired or influenced by the Indigenous community. The City of Edmonton is currently making a concerted effort towards using culturally significant names, and it matters, says Bruneau, even if there’s still a long way to go. Indigenous place names reveal information about the area’s geography, history and sometimes ecology. Names connect the land to the culture, while acknowledging the contributions of Indigenous people. Not recognizing those contributions — and even actively repressing them — has been a problem for decades. Generations are still affected by abuse that happened within the residential school system where children were stripped of their culture, language and sometimes even names. That erasure is reflected in Edmonton’s place names, says Matthew Dance, a geographer and open-date advocate who has been reformatting the information presented in the book Naming Edmonton: From Ada to Zoie. He noticed a pattern of mainly British place names — even with “Edmonton” itself is derived from an area in London. He’s in the process of answering those questions, and his project includes a list of the aboriginal place names and their meanings. Bruneau knows first-hand how easily a person’s history and sense of identity can be stripped, because it happened to him. He grew up in the Cold Lake and Elizabeth Settlement, as well as East Prairie Settlement, but he had no idea about his ancestors’ history. He didn’t learn until he was 26 years old when a relative starting telling the story of Papaschase, chief of a band who lived in the Rossdale Flats area until, through Treaty 6, they were moved to the Mill Woods area, only to be evicted after settlers and politicians complained to Ottawa. (Among those perpetrating that was Frank Oliver, whose name turns up all over Edmonton’s map.) The Papaschase dispersed, and so did their history. Discovering the history led to a reconnection with his culture, and strength of identity that he’d never had before. He wants to prevent others from being stripped of the things that show the importance of their culture — names being one of them. Names can be brought forward to the committee by developers or the public, or can be taken from an inventory of previously approved names from the Names Reserves List. The naming committee is made of voluntary members who commit to a one-year term where they research and approve names and consider naming requests. One of the challenges when it comes to naming, says Post, is trying to recognize the people and places of importance in history while also satisfying developers, who may look towards names that are “marketable.” Being marketable, in the past, meant “easy to pronounce and somewhat flashy,” Post says. In the past, members of the general, non-Indigenous public sometimes agreed. 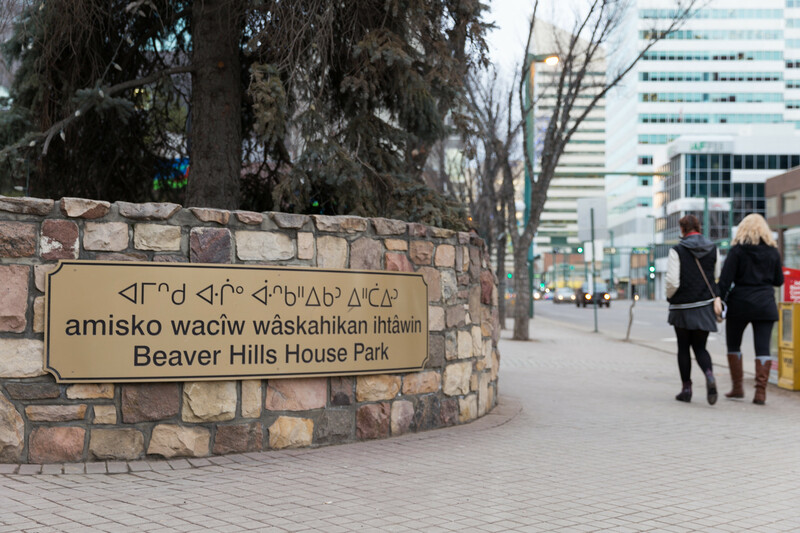 Cory Sousa, principal planner of the naming committee, says that when Beaver Hills House Park was originally named back in the late 1970s, it was approved as “Amiskwaskahegan”— the Cree name for the Edmonton area. But there were those who believed it was too hard to spell or pronounce, resulting in its anglicized name. In recent years, the Indigenous name, along with its Cree syllabics, have been added to the sign. More recently, the City worked together with the Enoch community to name Maskekosihk Trail, a portion of a road that connects Edmonton to the Enoch Cree reserve. The name means “people of the land of medicine.” The renaming was just one part of several initiatives headed by Mayor Don Iveson, including educating 11,000 City staff about impacts of the residential school system, creating opportunities for aboriginal youth to be involved in civic programs, and creating a place for Indigenous ceremonies and programs. The name still received some pushback when a city councillor argued that difficult to pronounce Cree names should be avoided, though he shortly afterwards apologized for his remarks. Aside from those comments, Sousa says the support the naming committee has received has been strong. Throughout his eight years with the committee, he’s worked on many aboriginal naming projects — including a huge subdivision on the south side of Edmonton that will be named for Alex Decoteau, a Cree Olympian in track and field the first aboriginal police officer in Canada. The Clareview-sized area, part of which was once Papaschase lands, will ultimately have many Indigenous names throughout. Dorothy Thunder, a full-time Cree instructor at the University of Alberta, was consulted by the City’s naming committee when it was deciding what to call the Edmonton Valley Line LRT bridge over the North Saskatchewan River. It was important to the committee, says Sousa, to connect the bridge to the Indigenous culture, but it wanted to get the “right word and name.” With the help of Thunder, they settled on Tawatina, the Nehiyaw (Cree) word for valley. Meanwhile, Okisikow Way (101A Avenue between 96th and 97th streets) is another example of a more recent place name that is meant to have significance for aboriginal communities. The name came from a suggestion by the City of Iqaluit in Nunavut urging Canada’s capital cities to name a street with the name that means “angel” in Cree. In 2011, Edmonton became the fifth Canadian city to do so, with the intention of bringing awareness to violence, particularly domestic, in the community. Thunder says names help create a sense of connection that has been lost for younger generations. Names aren’t just cosmetic, says Bruneau. He considers them one of many steps society should be taking towards reconciliation. It was one of the first steps, for example, taken in the town of Maskwacis. In 2014, the community of Hobbema changed its name to Maskwacis, meaning bear hills in Cree. But Thunder says it wasn’t so much a name change as a switch back to the area’s original moniker. The president of the Canadian Pacific Railway in 1891 named the town for his favourite Dutch landscape painter, but even after the change, many Indigenous people kept the name despite what it said on a map. The town, located south of Wetaskiwin and surrounded by four reserves, was known for gang violence, unemployment and despair. Some wondered whether reclaiming its Indigenous name would get to the root of such problems. But Bruneau says it’s an important step. Bruneau sees the work by the City going beyond the naming process. He says members of the Papaschase band are working on an employment and training centre along with offering introductory Cree courses. They’ve also been consulted by the City to work with the Edmonton Arts Council to put out a call for artists who will tell the story of the Papaschase in the Valley Line LRT station. Bruneau is happy to see the way the City is taking steps towards including Indigenous people in the process of naming and in other projects; and he’d like to see even more collaborations. After all, he says, in the past, it seemed as though some names were chosen by a well-meaning person just for the sake of having a few token Indigenous-sounding names. Join the Naming Edmonton Project: Dance has a group of volunteers helping with the project in many ways to make the data in Naming Edmonton: From Ada to Zoie more available.. It’s a great way to get involved if you’re interested in technology, history, challenging the status quo and understanding naming as a method of control, he says. Join the Naming Committee: Sousa says the Naming Committee is also looking for new members to start in May of 2017. He would especially like to see more individuals knowledgeable about aboriginal culture. You can apply by going to the website and filling in the information for the one-year post. Suggest a name: For those who have a name they feel is significant and would like to see in the community, Sousa suggests submitting an application to the Naming Committee, as well as a biography and justification letter for the Names Reserve List. The applicant is required to do “do the due-diligence of researching, consulting, obtaining family consent and justifying why the name is important to be recognized,” says Sousa. Stay informed: Subscribe to the newsletter produced by the City’s Indigenous Relations Office to stay up-to-date on what community organizations are doing on a number of issues.